Recharge your batteries whilst enjoying the panoramic views over the beautiful Spring Beach and Maria Island, or walk 100 meters down to the turquoise water and white sands. The villa is set on a large block amongst landscaped gardens, and natural bush. It is extremely peaceful and tranquil. Ideal for anyone looking for a relaxing and private escape. The villa is fully self contained and very well equipped for short or extended stays. It is light and airy with all day sun. The villa is fully equipped for children. High chair, port a cot, toys books DVDs and games are all provided. It comfortably sleeps 4- 6. The main bedroom has a queen bed and beautiful views of the water. The second bedroom has two sets of single bunk beds. A portacot is available at no extra charge. A cosy wood heater ensure warm nights over winter. It also has a flat screen TV, DVD, and CD player. There is a full size tennis court available for guest use. Spring Beach is located on the East coast of Tasmania. It is the one of the first beaches heading up the east coast with the turquoise water and white sands so often seen in images of Wineglass Bay. It is an easy 1 hour drive from the Hobart CBD or 45 minutes from Hobart airport, and 5 minutes from the Orford Cafes and shops. Spring Beach is a truely magical spot. This villa sits on a spacious and private block amongst the trees and the birds yet looks directly over Maria Island and Spring Beach. You can do as much or as little as you like once you arrive. Walking the cliff tops, having a game of tennis on the full size court or just resting back on the deck watching and listening to the waves roll in. This villa is located on spacious and flat block amongst the trees. It is immaculate and very well equipped. It has a fire for those cool nights and also captures all day sun. 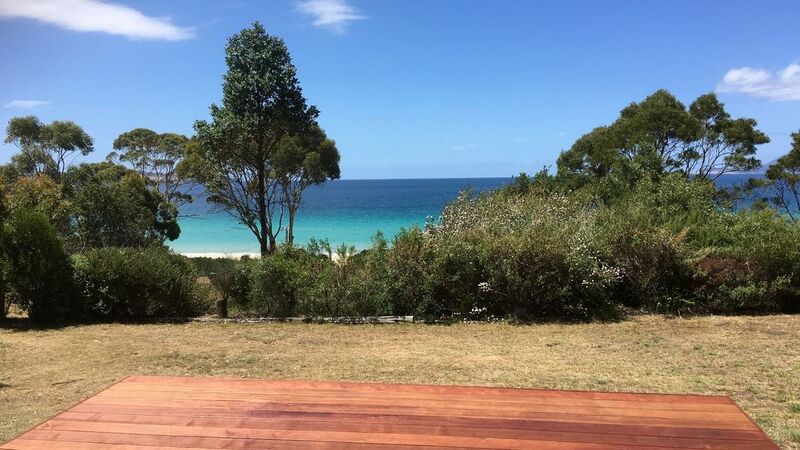 It's unique private location and the incredible outlook along with being very close to Orford and Hobart make this an ideal place to stay for a weekend or a month! Villa @ Spring Beach is a wonderful place to spend a few days. Perfectly situated only a few minutes on the beach and really nicely laid out. Has all that you need. Really recommend it for anyone who wants to get away for a few days. Thanks so much for staying Geoff. The villa really is in a wonderful location. I am so glad the villa offered all you needed. Plenty of room to spread out and relax. Next time we will need to stay longer. Thanks so much for staying Alison. I am so glad you enjoyed the villa and all that beautiful Spring Beach has to offer. We look forward to having you back. Clean, spacious villa, located a short walk from the white, sandy beach. Good view of Maria Island. Great little house, well equipped. So close to the beach with lovely views & deck. Definitely recommend. Many thanks Sarah for sharing your fabulous cottage. As a group of tired mums in need of a weekend break, the cottage was a perfect mix of cosy comfort in an excellent beach location. Plenty of walking, talking, laughing and food made for the perfect restorative weekend. Thanks for staying with us Fiona. It is a magical spot to recharge the batteries!